This product has been designed specifically for users of ultrabooks, notebook, laptop PC and tablets with USB Port. 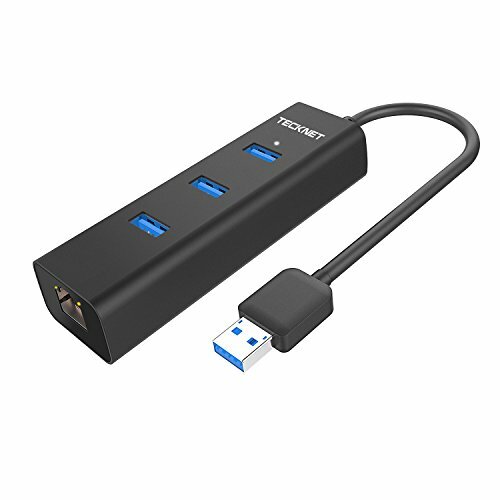 It offers a simple and practical expansion of three USB 3.0 ports and one RJ45 Gigabit Ethernet connection. Since the length of the USB cable is approximately 30cm (1'), it's advisable to also order an extra USB 3.0 extension cable along with this product If you intend to connect it to a desktop PC. HU043 adds three extra USB ports to your PC making the need to swap between devices unnecessary. Connect to the 1 gigabit ethernet port and access superfast wired network speeds of up to 1000Mbps. We've given it a 30cm USB 3.0 cable to make sure your data syncing is just as quick. HU043's mult-protection design avoids potential damage to your connected devices whether you're transferring data or charging them. For a stable connection, don't use this hub with high power consumption devices, such as external hard drives. The hub will sync but not charge tablets and other devices which require a higher power input. At TeckNet, we believe in our products. That's why we back them all with an 18-month warranty and provide friendly, easy-to-reach support. Instantly adds 3 extra USB 3.0 SuperSpeed ports and 1 x RJ45 gigabit ethernet port to your ultrabooks, notebooks and tablets featuring USB interfaces and enjoy data transfer rates of up to 5Gbps, backwards compatibile with 10/100 ethernet or USB 2.0/1.1 devices . Compact, lightweight, portable, Tecknet USB 3.0 hub ensures a neat and uncluttered arrangement of all connections making sure that plugs and cables do not interfere with each other. Perfect as an external extension solution. Supports IPv4/IPv6 protocols, dual channel transfer mode, auto transfer and data stream reversing regulation. What you get: 1× TeckNet 3-Port USB and Ethernet Hub, 1× User Manual. Enjoy 18-month warranty, free lifetime technical support and friendly customer service.